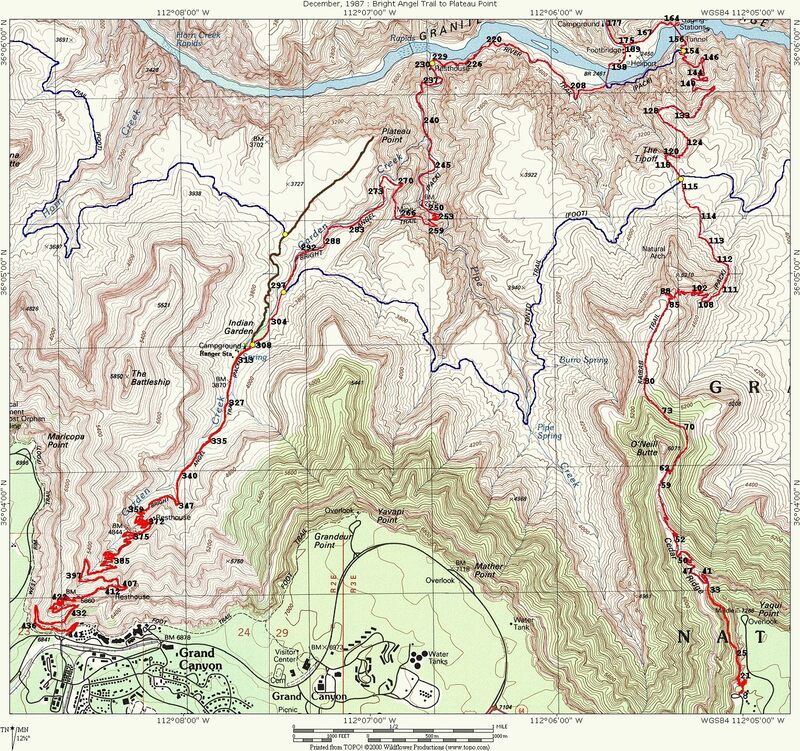 The map at the left shows the detailed view of the fifth part of the virtual hike with the pictures numbered. Most of these locations are fairly accurate, but some just "best guesses." 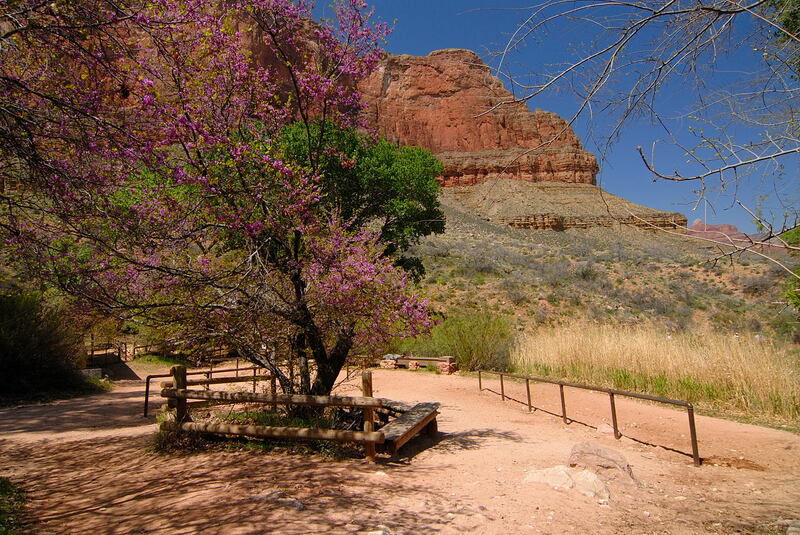 We have arrived at Indian Garden! This is truly an oasis. 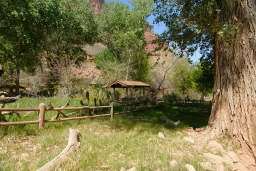 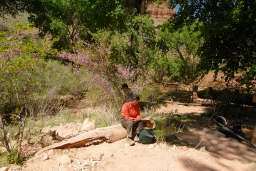 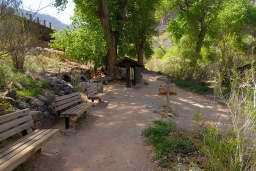 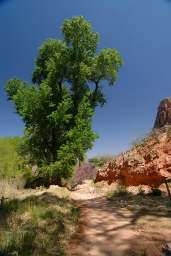 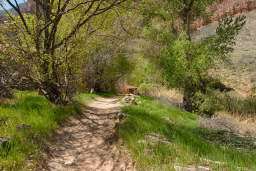 There is Garden Creek, the cottonwood trees that provide shade, lots of other vegetation, and a natural spring to provide drinking water. Looking through binoculars from the rim, there appear be three large buildings and at least a dozen smaller ones which look like small cabins. 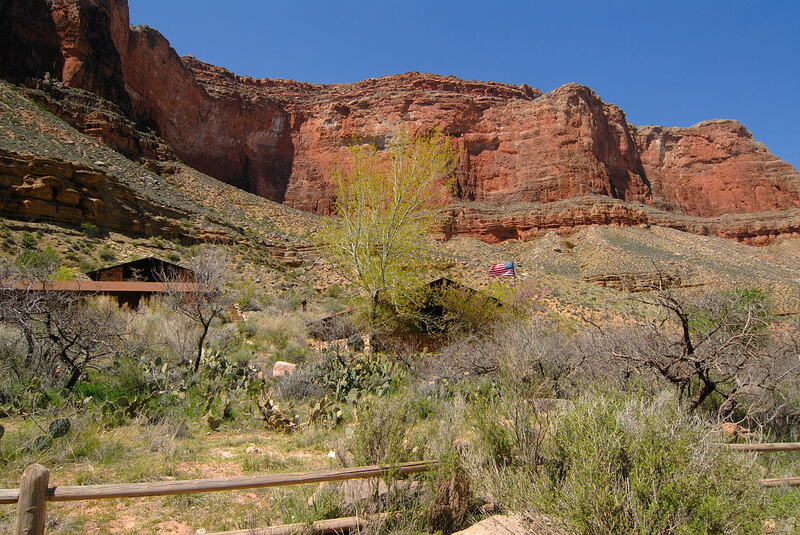 The large buildings are ranger station and the small ones aren't buildings at all. They are ramadas with picnic benches underneath. What a wonderful setting for a picnic! Below Indian Garden there are normally a trickle of hikers, most of them decked out in full gear for an overnight stay at the bottom. 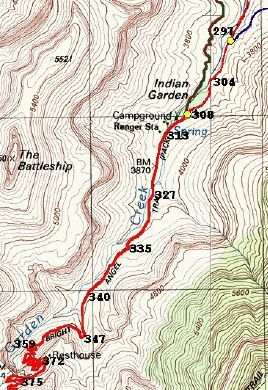 This changes at this spot. Suddenly there are hikers everywhere, and many appear to be day hikers. 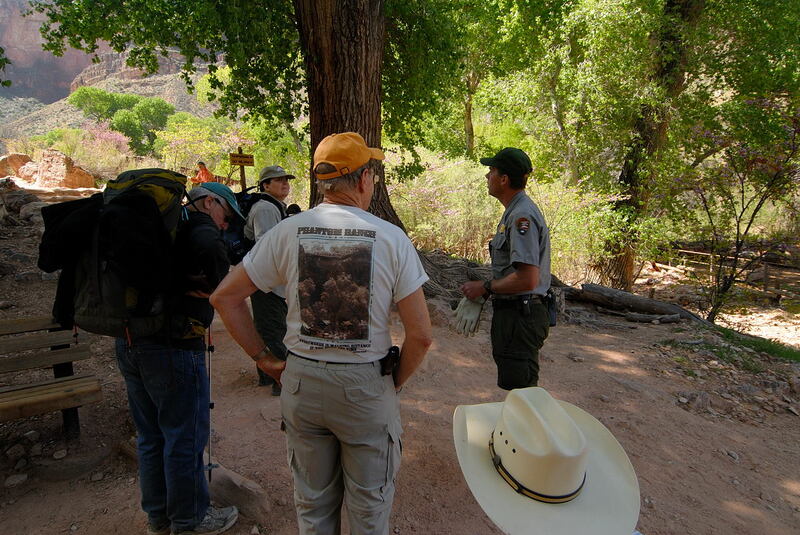 On this day I found a group taking the mule trip in the process of mounting up. 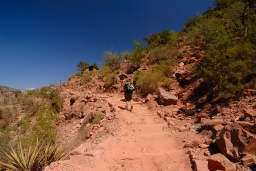 For some reason I thought they were on their way down. 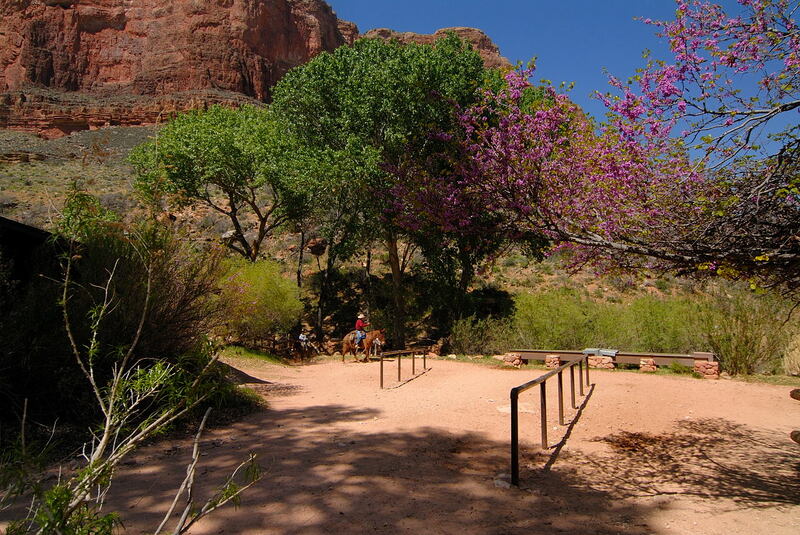 The mules are wonderful, but I have no desire to trail behind in close quarters. 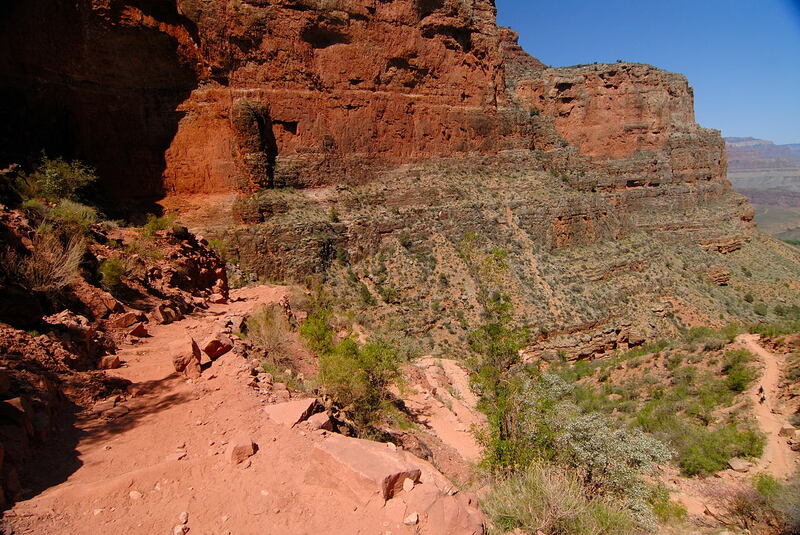 On this trip once again I'm dogged by the mules. 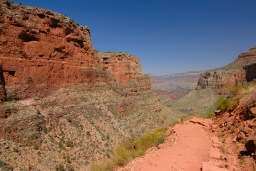 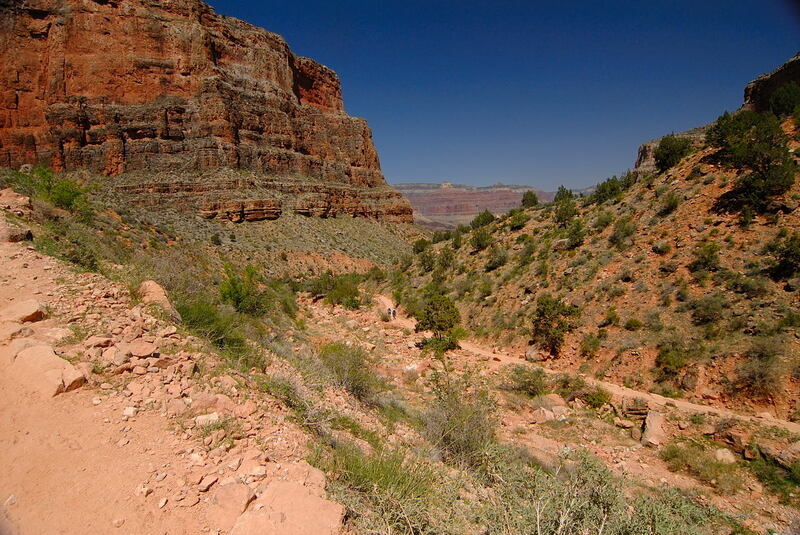 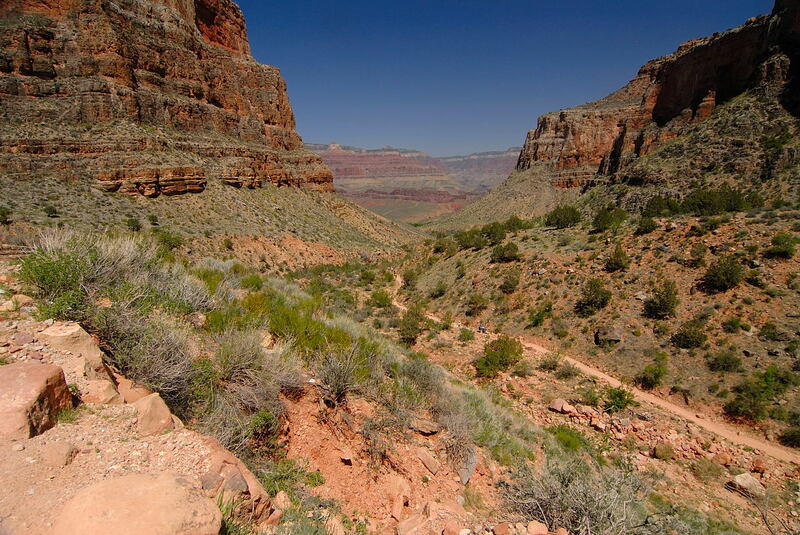 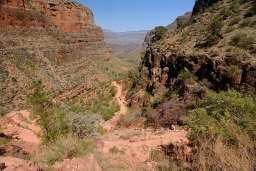 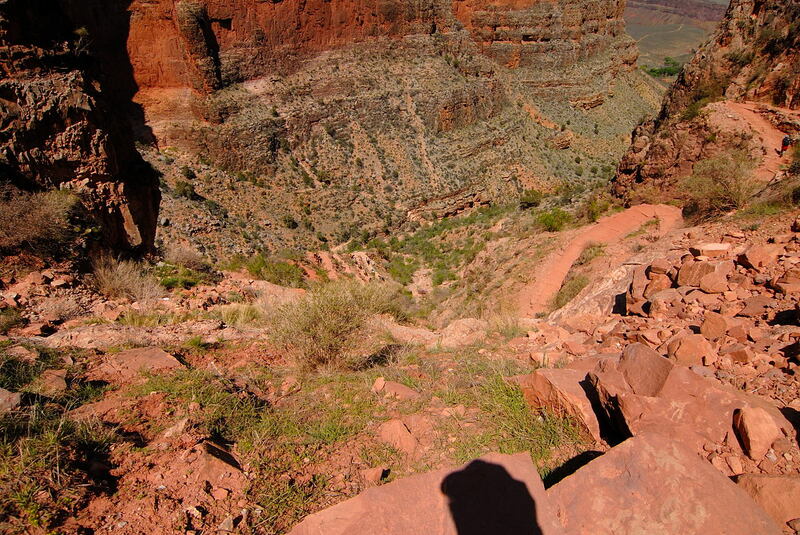 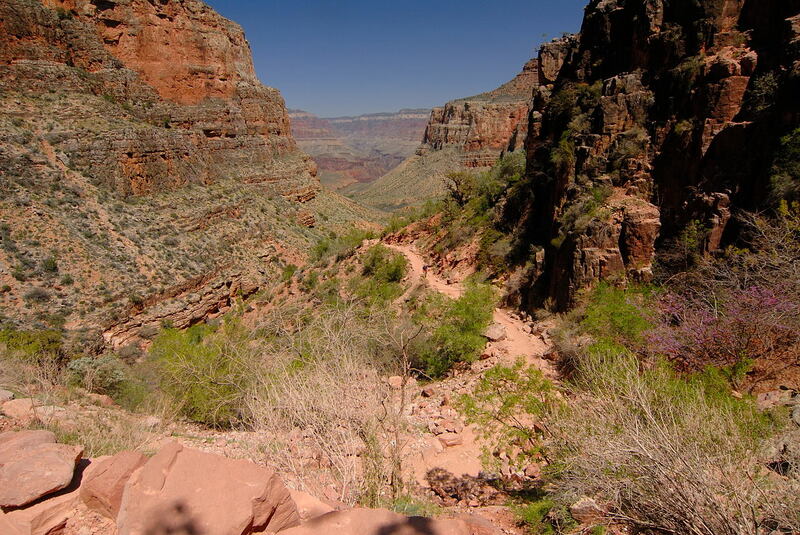 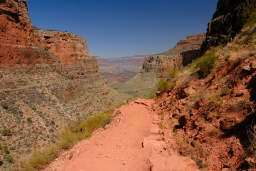 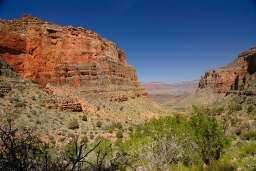 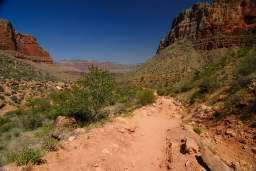 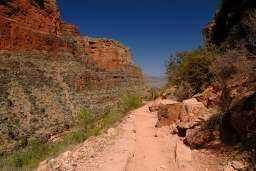 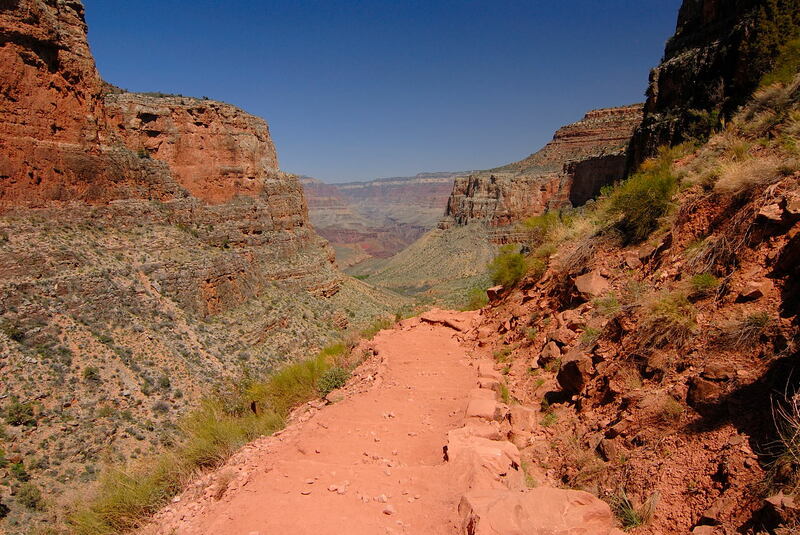 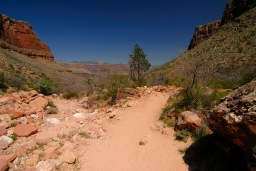 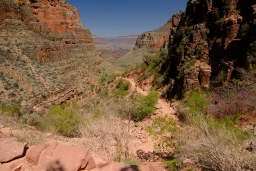 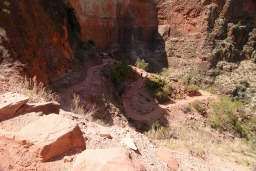 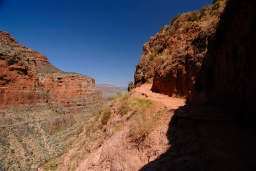 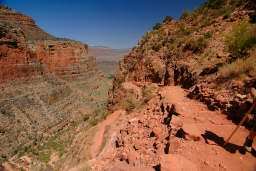 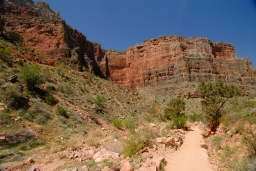 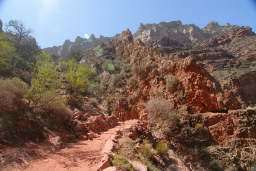 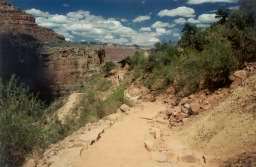 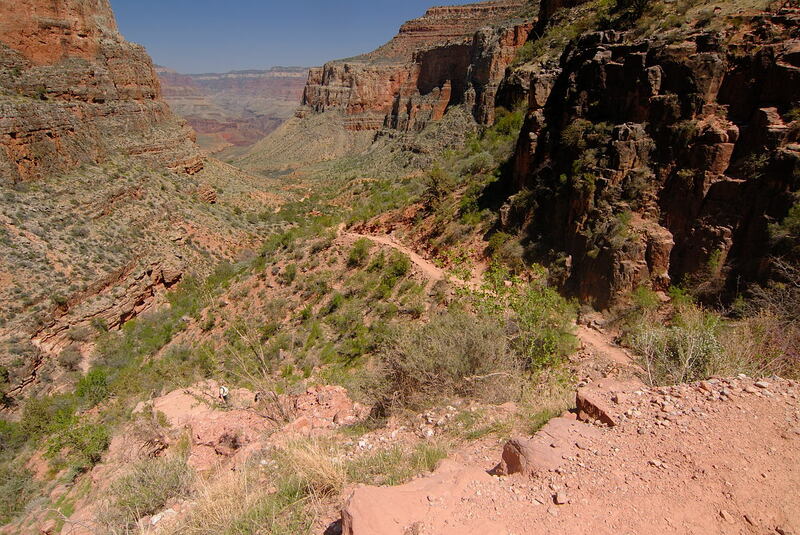 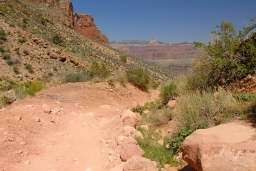 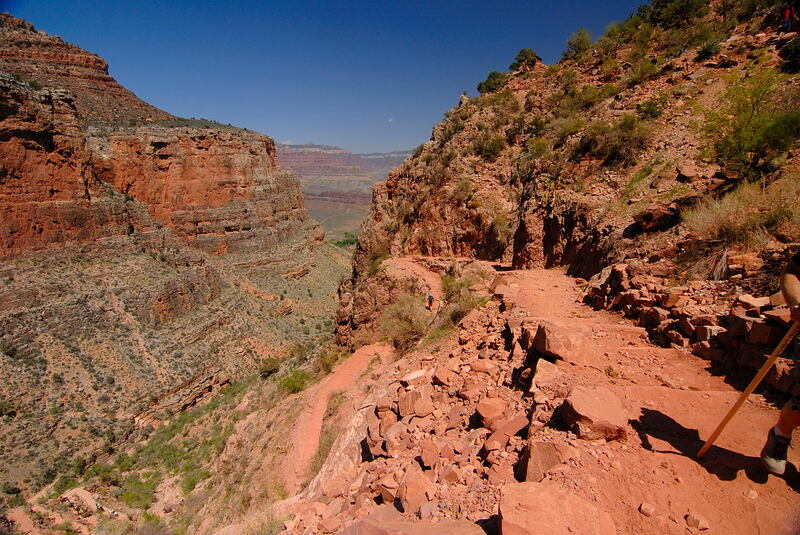 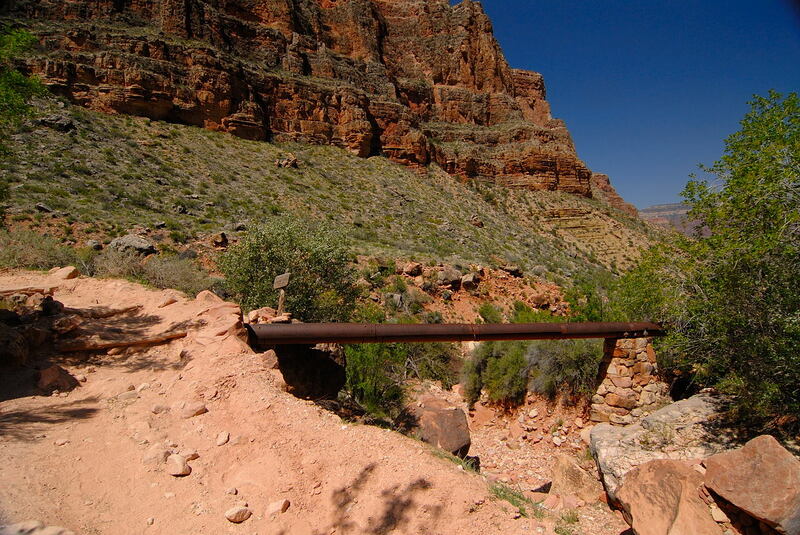 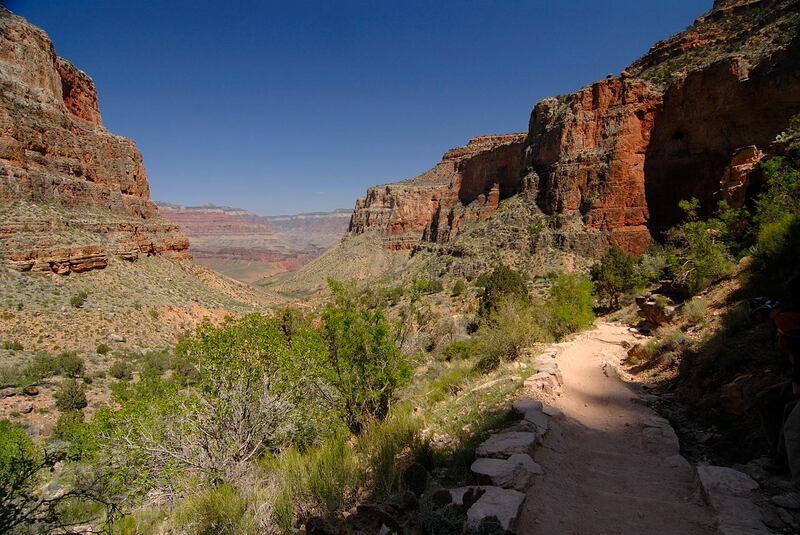 In picture 310 above you can just see the mule train arriving from Plateau Point Trail. 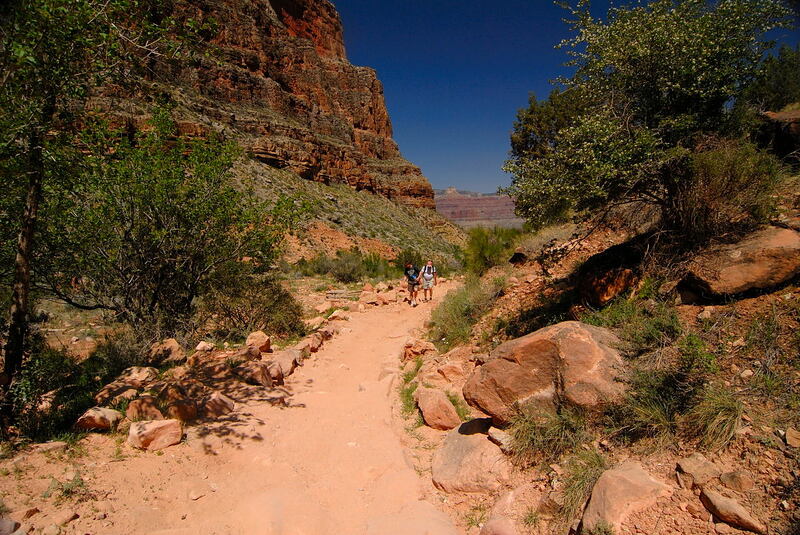 I know they will only be staying here briefly and will then head up the trail following me. 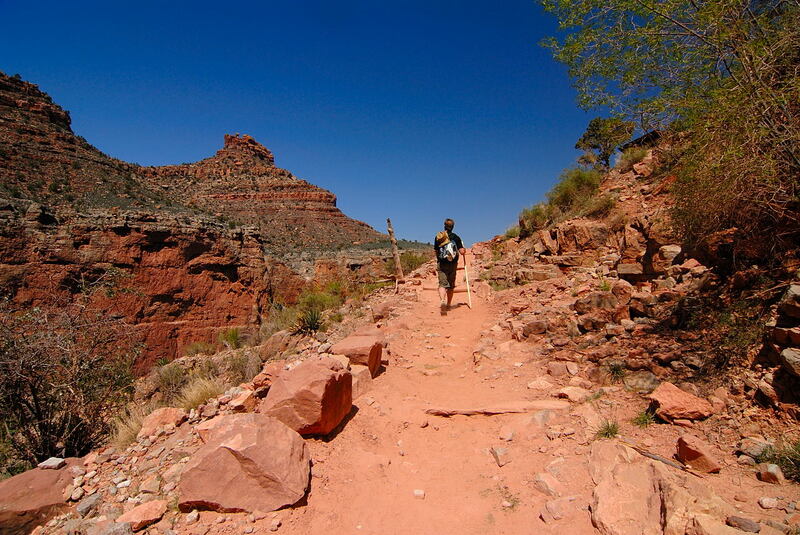 You have two choices: if you're physically fit, you can attempt to stay ahead, or you can let them pass and let them get a good distance ahead. 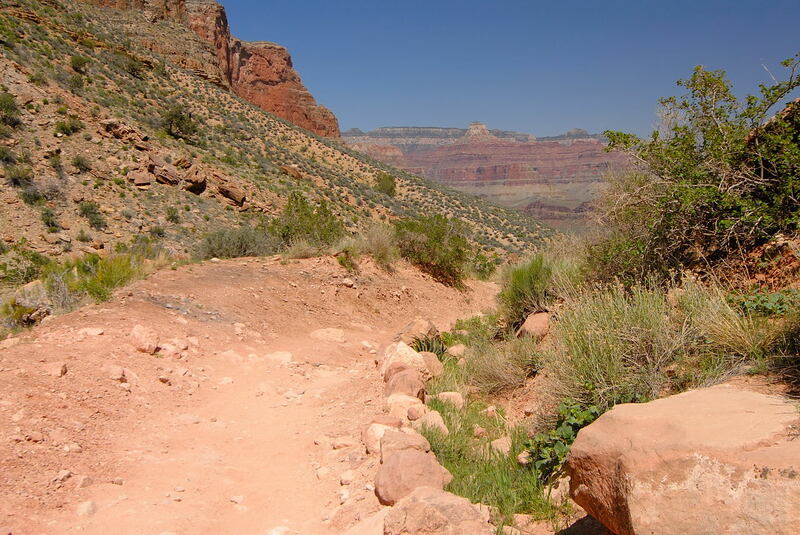 When the mules move, they move fast, but they make frequent stops. 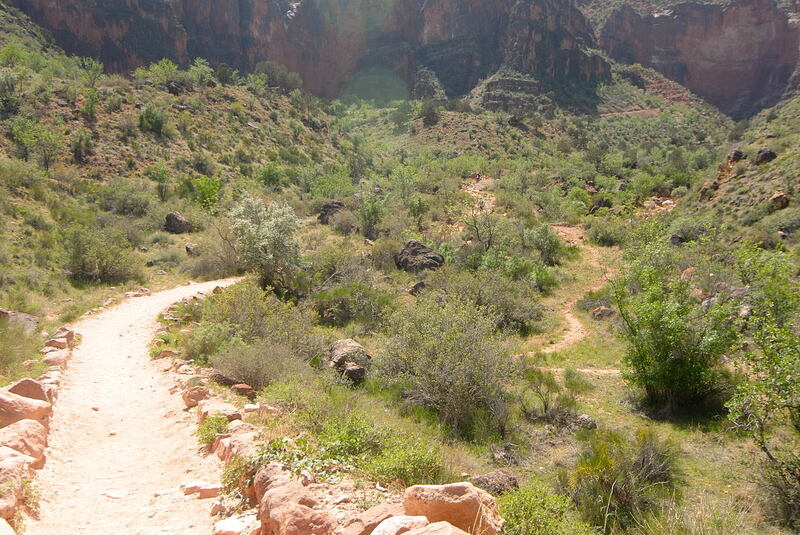 For the rest of my hike I would be looking back to see if the mules were gaining on me. 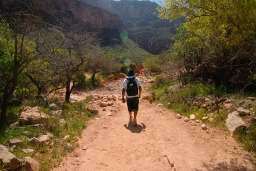 I would and I was gaining ground. 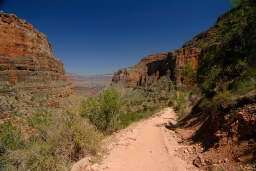 I get a great satisfaction out of this for some reason. Maybe it's the thought of beating the Grand Canyon climbing professionals! 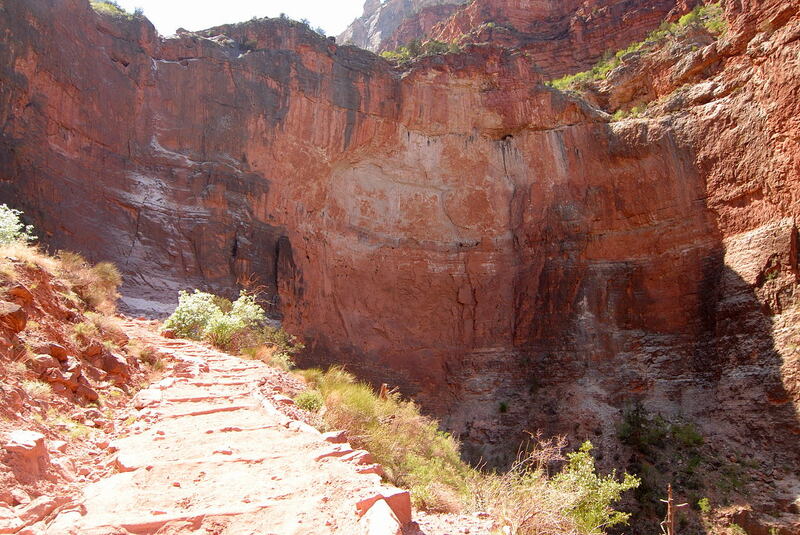 Yeah, I hear the mules complain, "Try climbing out of here carrying a 150-200 pound tourist!" 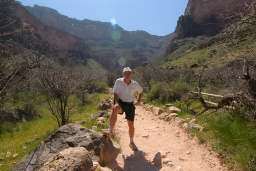 If you happen to see this guy on your hike in the canyon, exercise extreme caution as he is clearly not properly outfitted for a hike of this magnitude! ;-) Yes, this your virtual hike tour guide finally giving the camera to a passing hiker (who is decidedly not showing enough caution) to snap a picture. 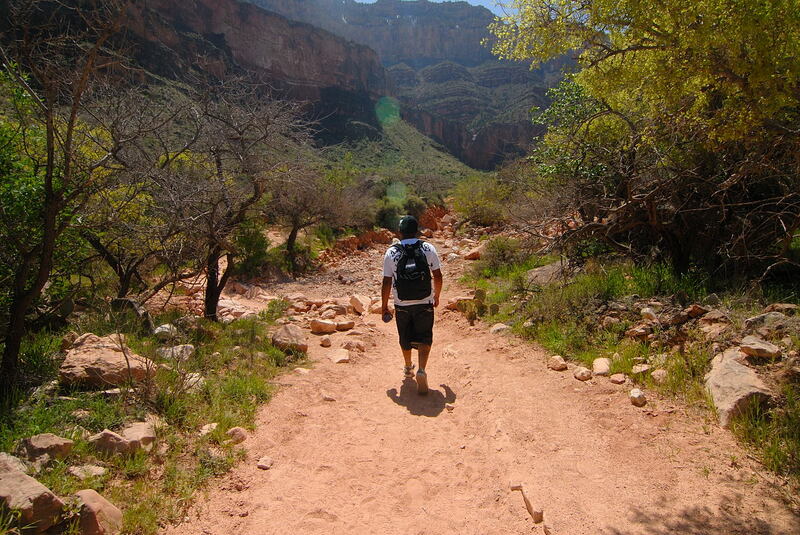 I'm feeling relatively fresh at this point, although I will tell you mostly relieved. 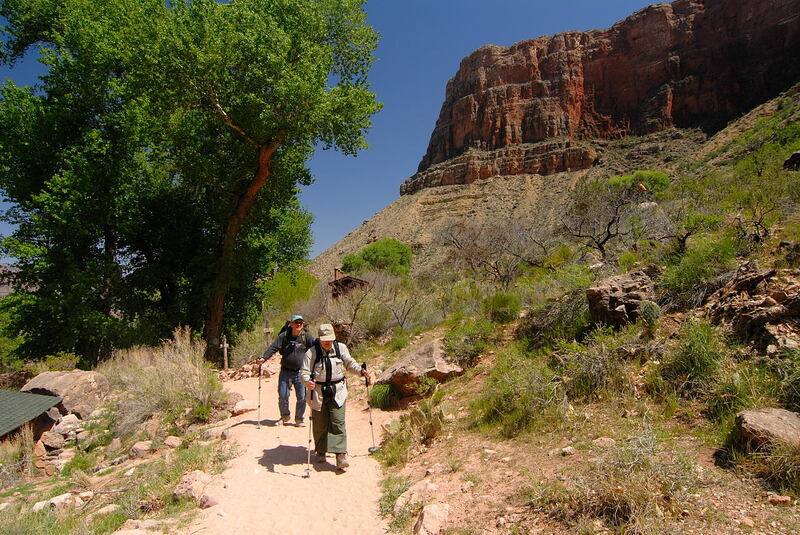 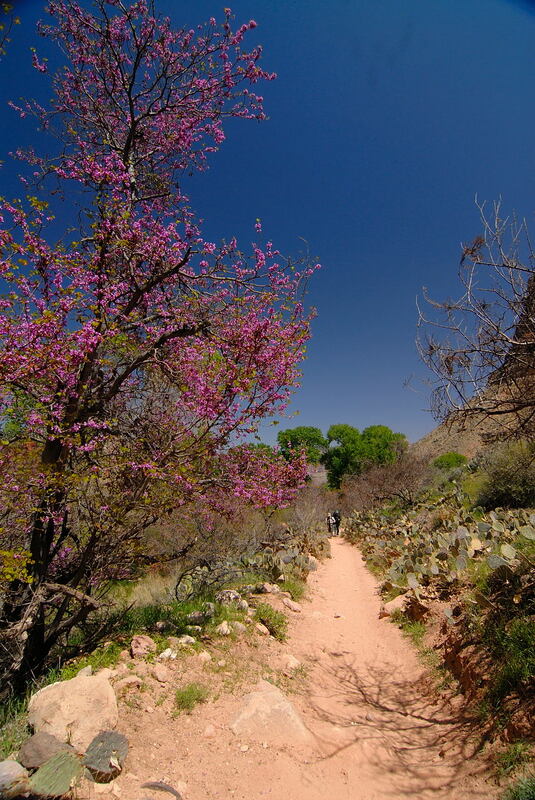 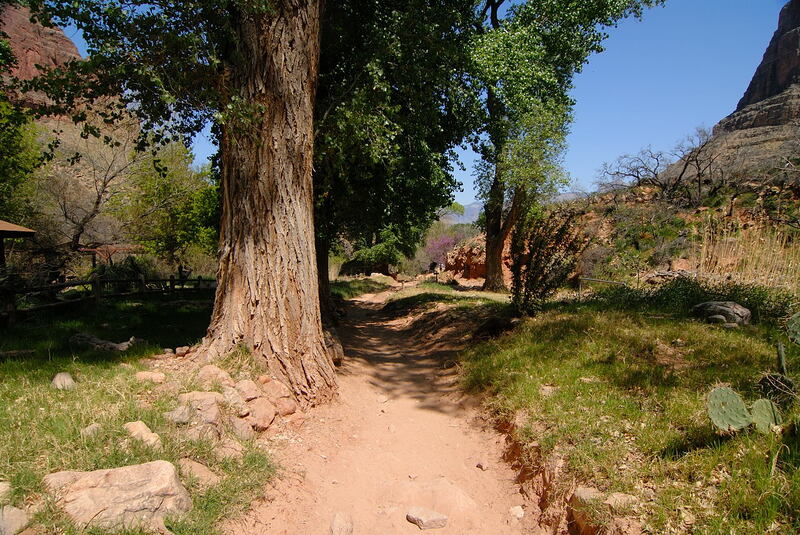 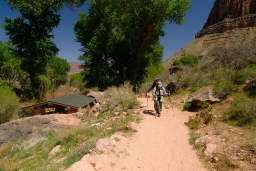 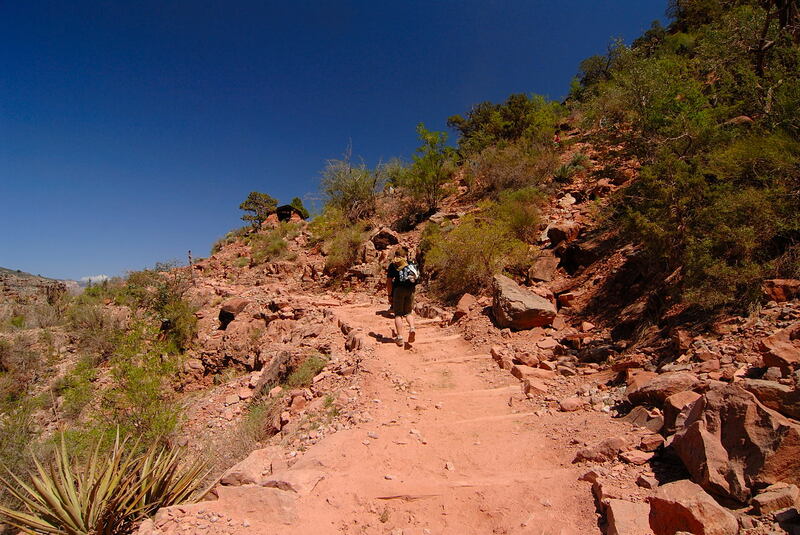 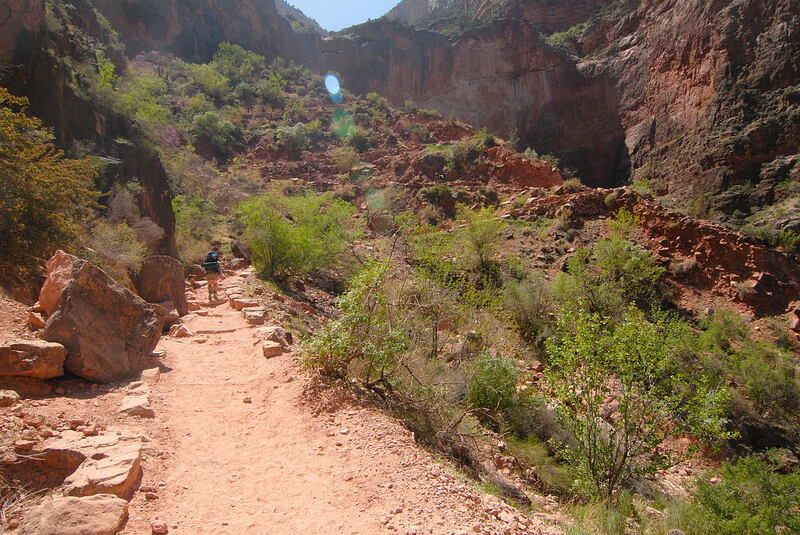 If the hike is going to be really tough, you'll already be feeling that by the time you arrive at Indian Garden. But we're hardly out of the woods (well, figuratively, because after Indian Garden there are really no more trees!) 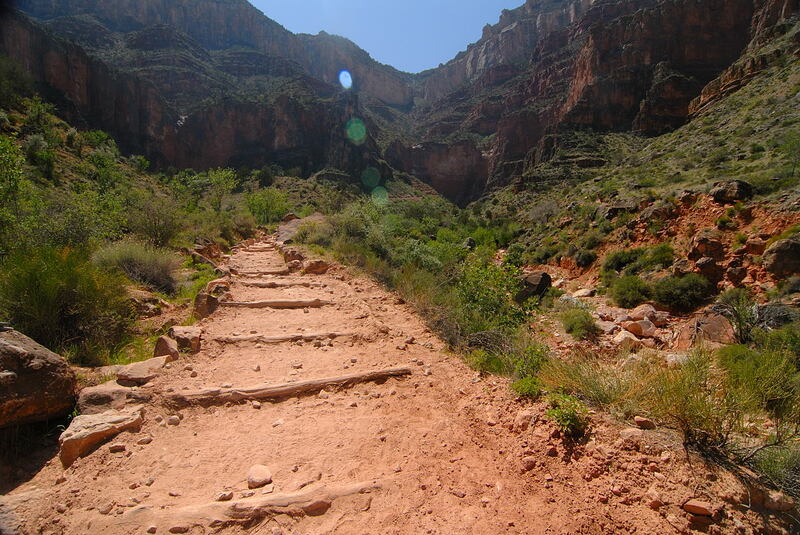 as we have about 4.5 miles to go. 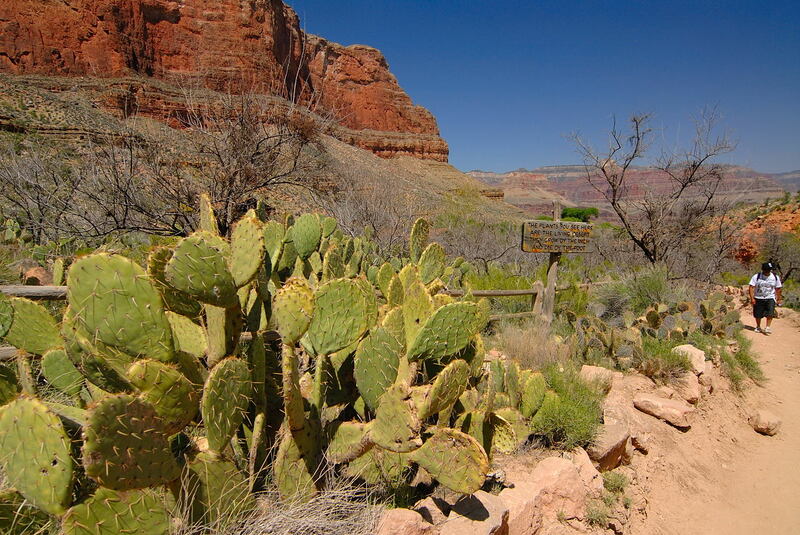 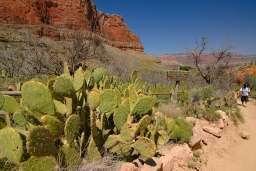 As you head out of Indian Garden, you will pass a lot of prickly pear cactus. 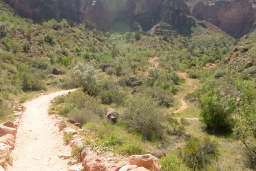 One section had it on both sides of the trail for 100 feet. 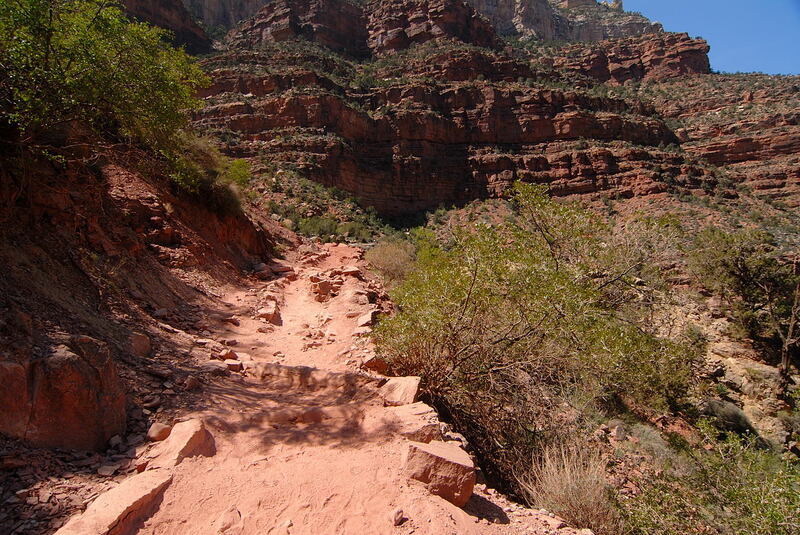 It has been only a very gradual grade for the last mile and a half and the trail has been relatively straight. The now changes as approach what at first glance kind of a reminded of the "Cliffs of Insanity" from the movie The Princess Bride. 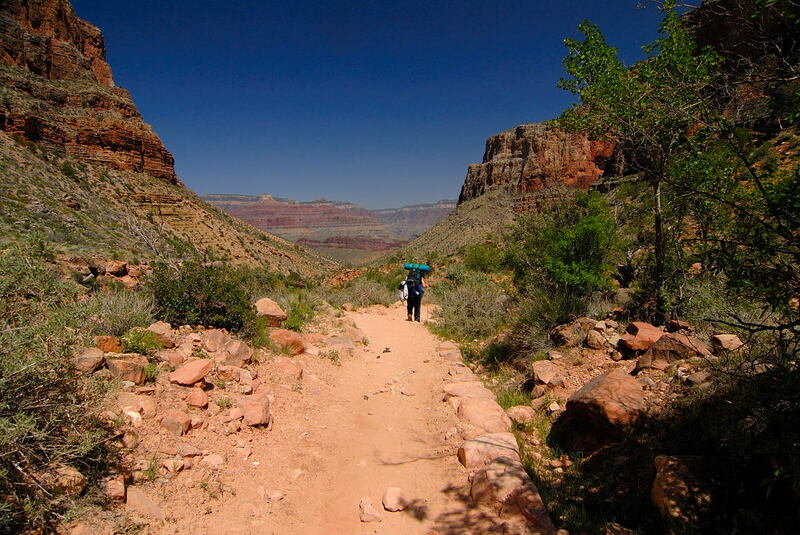 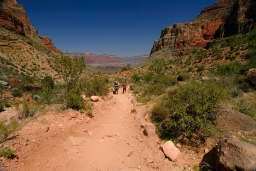 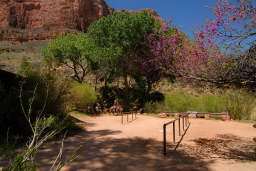 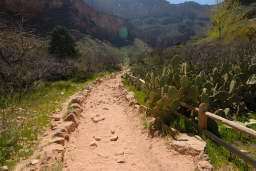 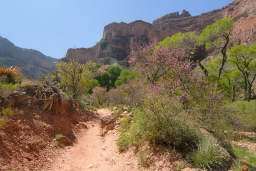 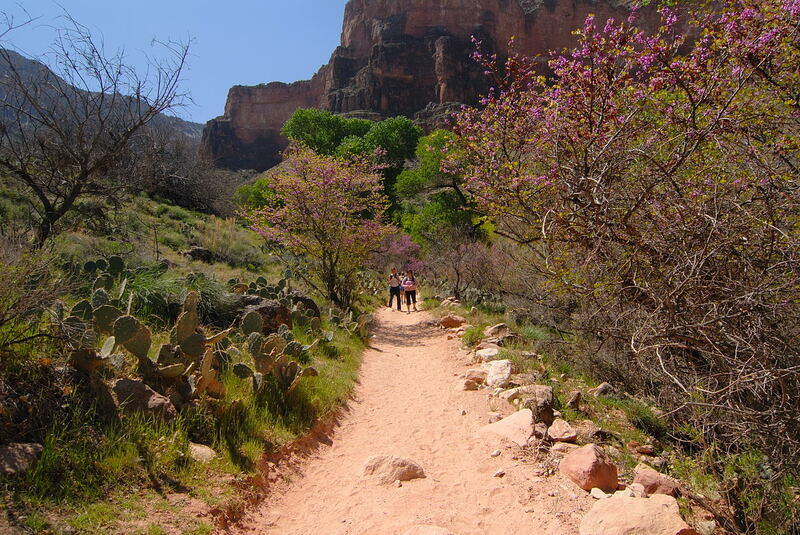 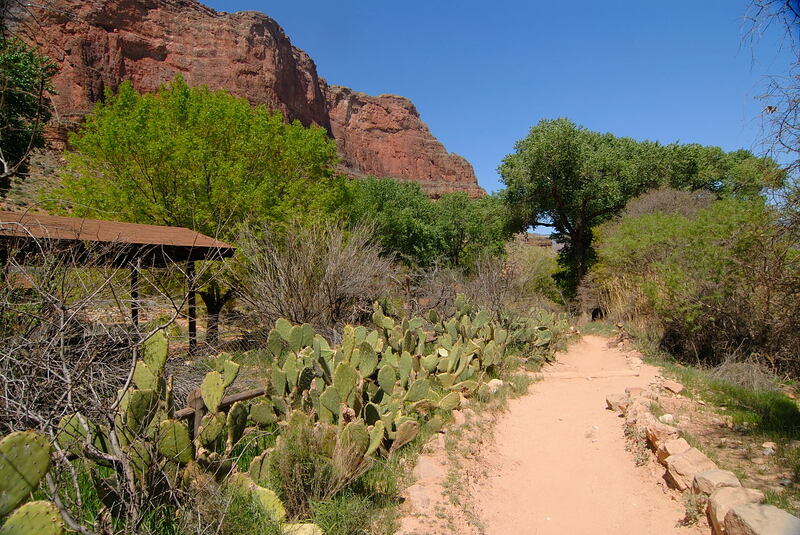 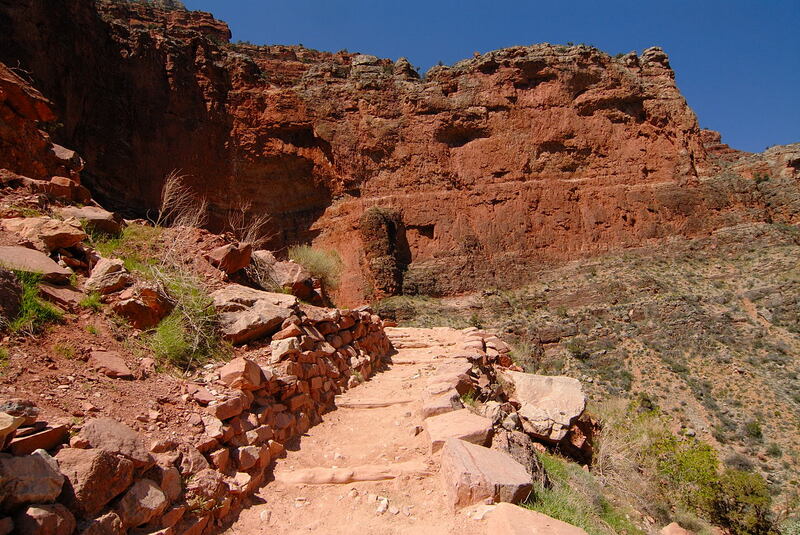 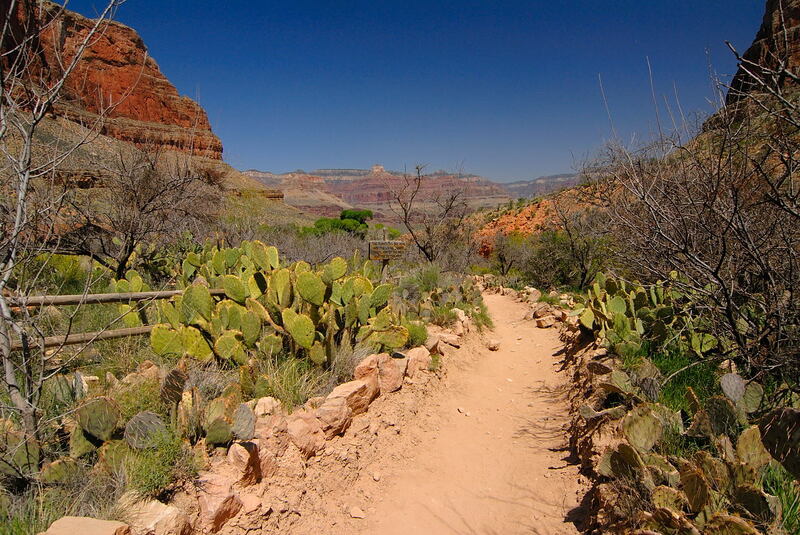 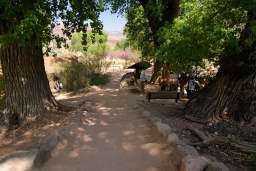 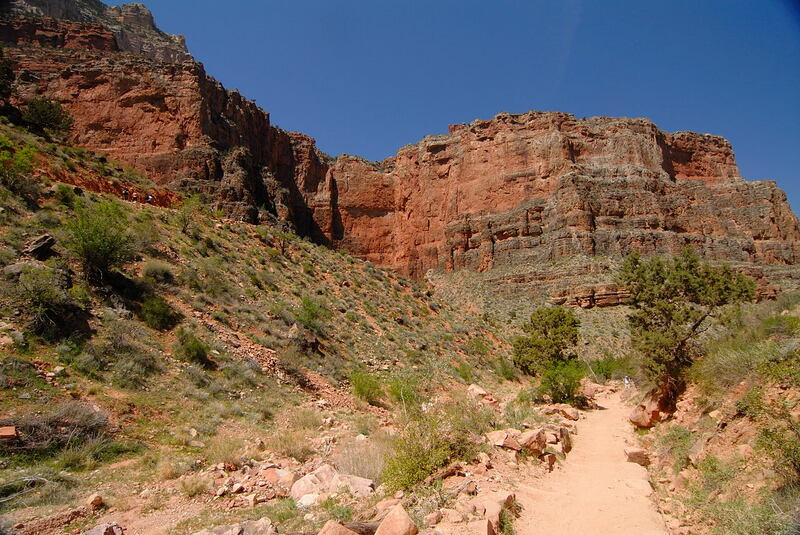 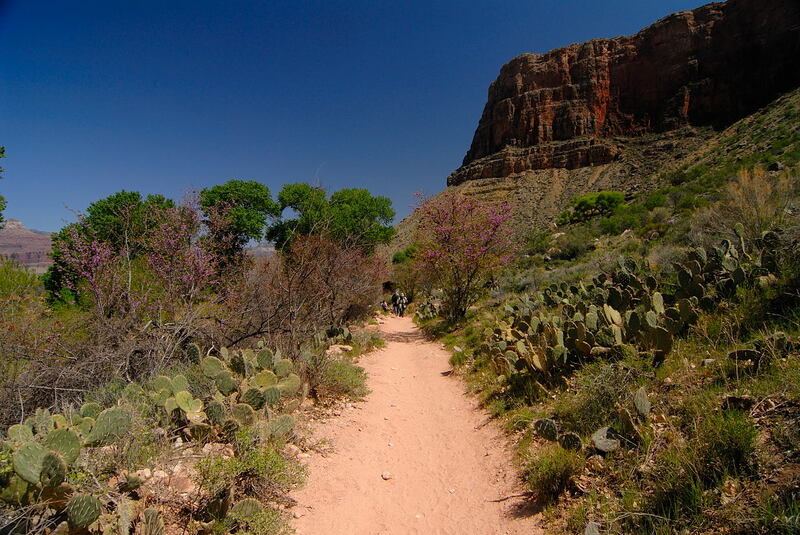 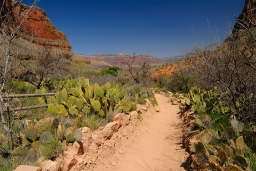 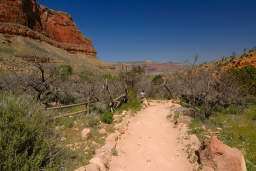 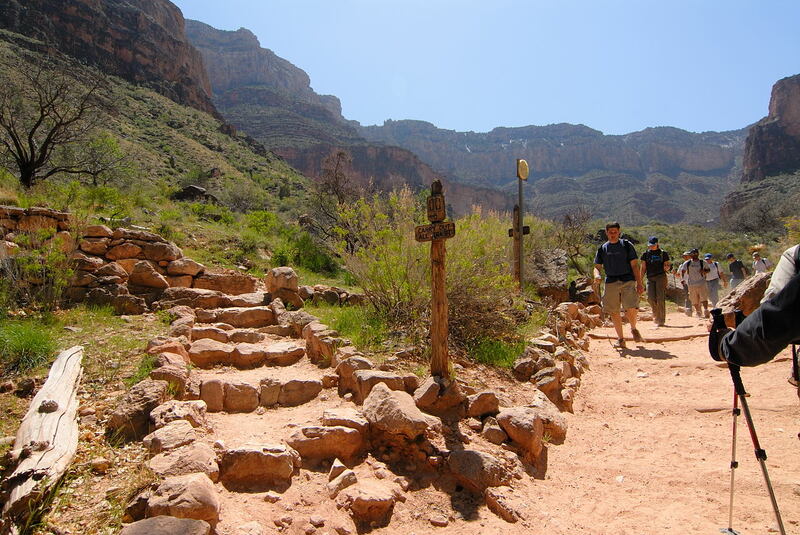 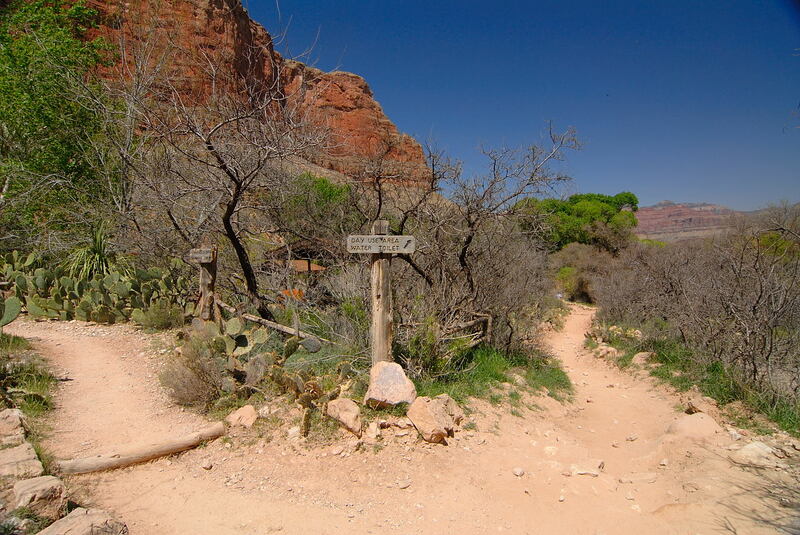 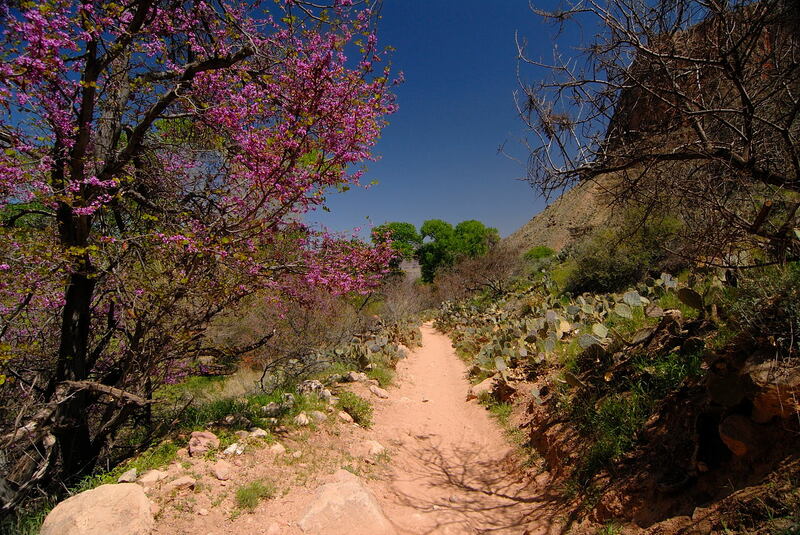 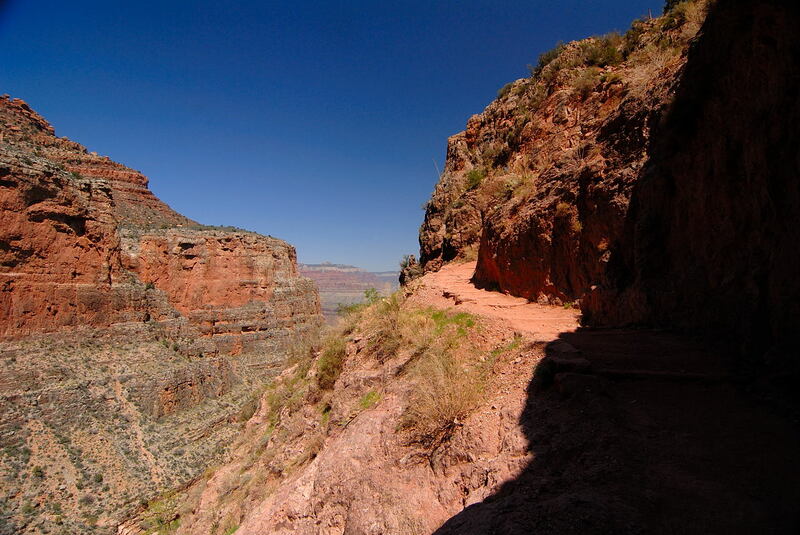 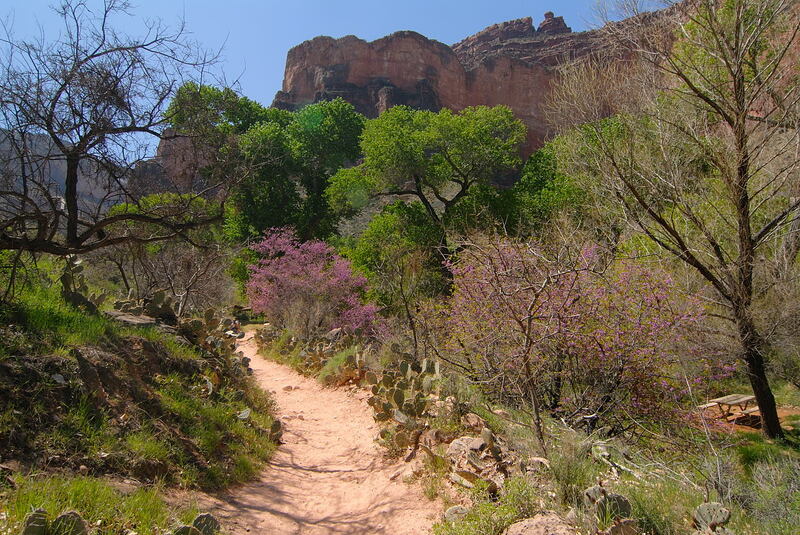 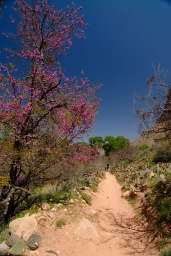 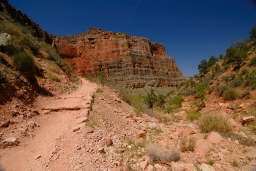 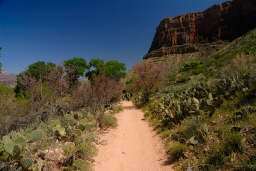 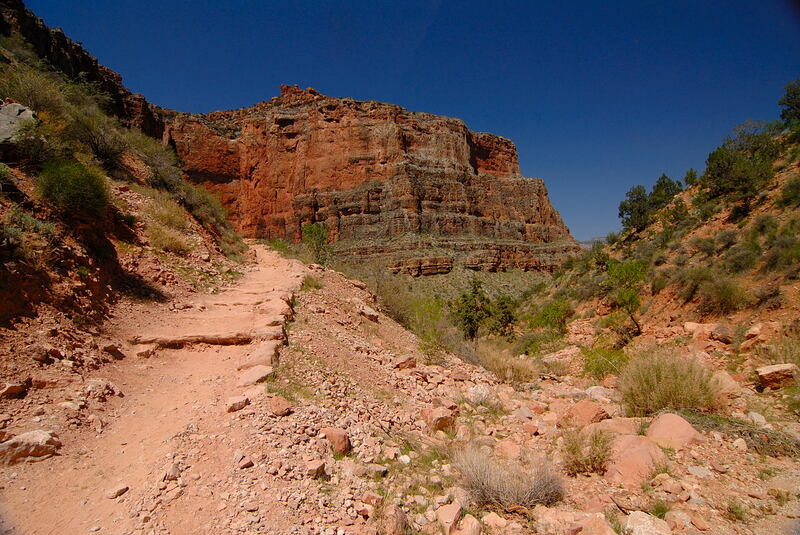 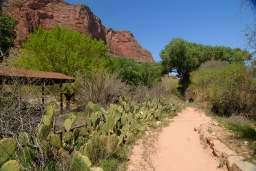 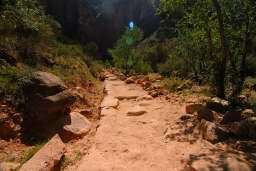 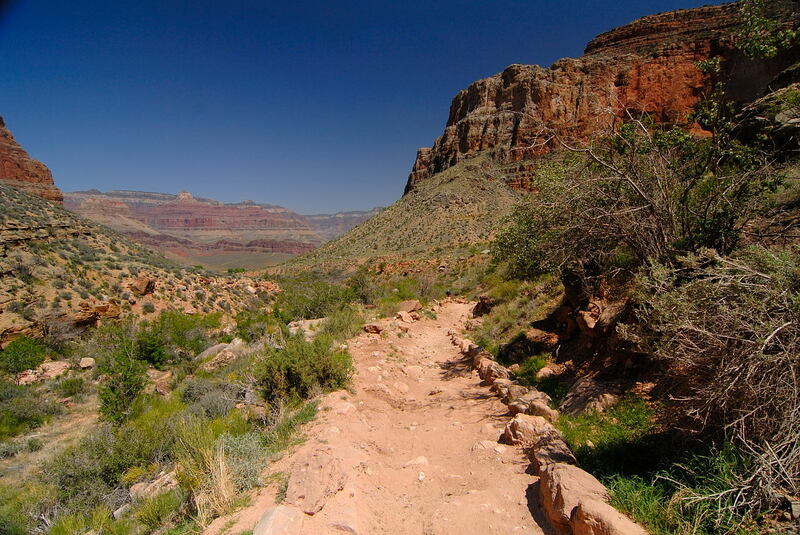 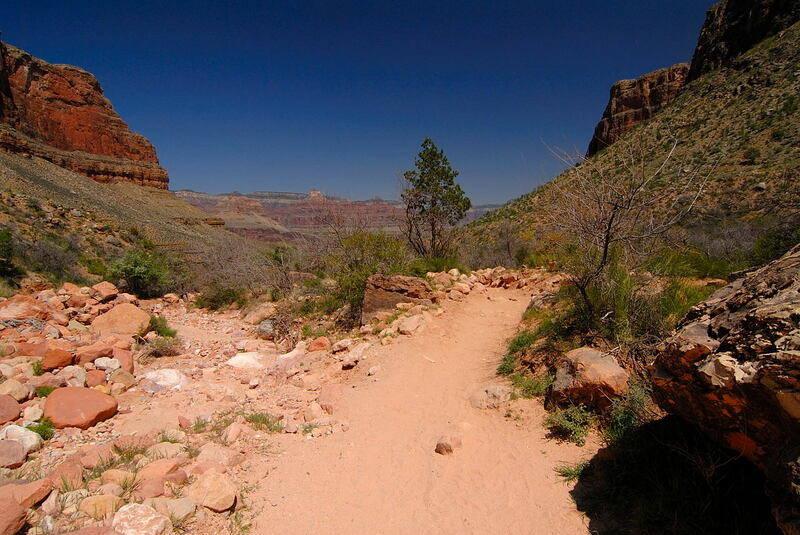 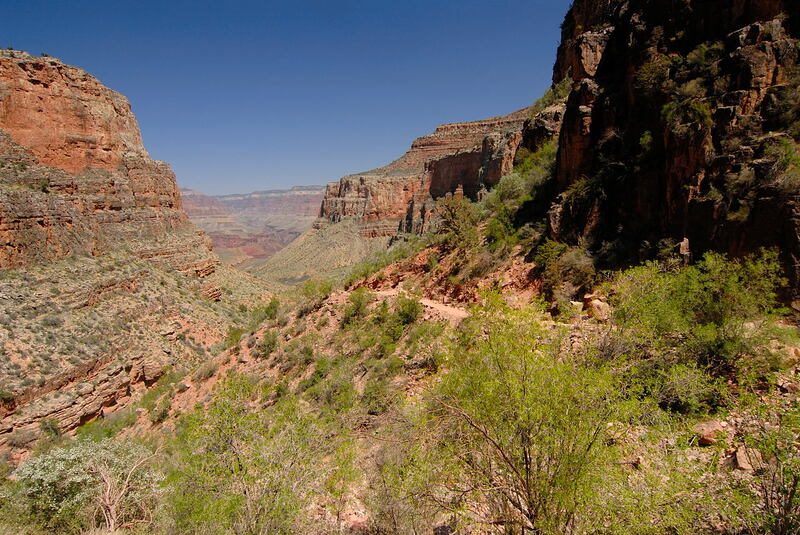 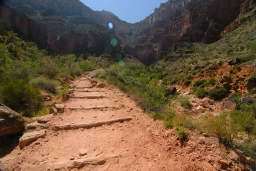 The trail will now switch back and forth from here to when we finally arrive at the Bright Angel Trailhead. We've made it to the 3-Mile Resthouse. There is only 1 more page to complete the hike. To continue on hit next.